This Gul Papdi or Gol Papdi Recipe is a Maharashtrian version of the Gujarat’s ever famous Sukhadi. 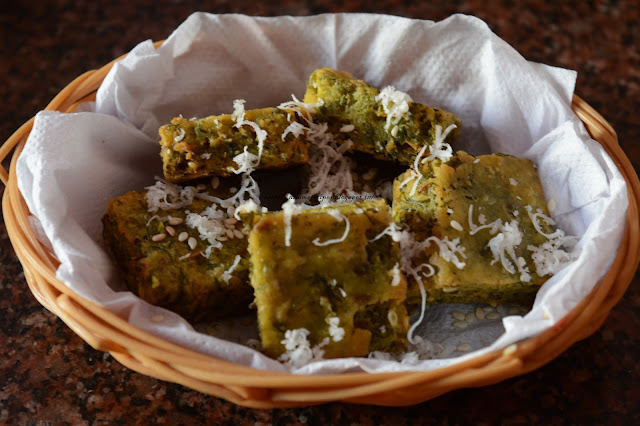 Gol Papdi is a sweet recipe that is healthy, especially during the winter. Made with wheat flour (gehu atta) and jaggery, this is an exceptionally easy recipe. Here we have added Poha (Flattened rice), dry fruits, nutmeg powder, cardamom powder for additional flavor, which is optional, if you don’t have any of these handy, you can eliminate these as in the traditional recipe, only wheat flour, ghee, jaggery is used. But adding the optional ingredients adds additional flavors, aroma, thus for an enhanced flavor, I have added these ingredients. Don’t forget to turn off the flame before adding the jaggery and other ingredients, or else you will end up with hard, chewy Sukhdi. This is served especially to the nursing mothers as it is a nutrition filled, tasty energy bar. Heat ghee in a pan, fry thick Poha, remove and keep aside. In the same pan, add remaining ghee, wheat flour and roast it till it leaves a nutty aroma or turns golden brown. In a mixer, add the fried Poha and grind till you get a fine powder. Now add this to the wheat flour. Switch off the heat and mix cardamom, nutmeg powder and grated jaggery. Combine well till the jaggery melt. Grease the plate with ghee and pour the mixture on it. Spread the mixture with a greased bowl. Once it cool completely remove and store into airtight container. 1) Heat ghee in a pan, fry thick Poha, remove and keep aside. 3) In a mixer, add the fried Poha and grind till you get a fine powder. Now add this to the wheat flour. Switch off the heat and mix cardamom, nutmeg powder and grated jaggery. Combine well till the jaggery melt. Grease the plate with ghee and pour the mixture on it. 4) Spread the mixture with a greased bowl. Cut into desired shape. 5) Once it cool completely remove and store into airtight container.